I first reviewed Mother India back in June 2006. At that point, the restaurant had just opened its doors and was serving up some tasty Indian food (including great thali) in some digs I described as basic, complete with chairs and tables that evoked the dreariness of some of Toronto's beloved hospitals. Stopping by Mother India this week, the menu has drastically changed but the ambiance remains relatively the same. 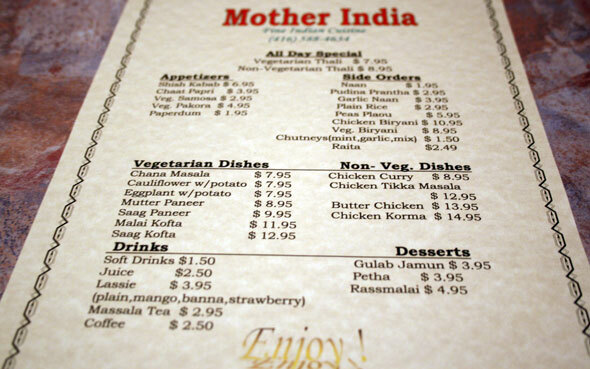 Just two months after their opening a couple of years ago, Mother India shuttered their doors and re-though the menu. The result is a card that features almost twenty rotis, five rice dishes ($7.95 - $12.95), vegetable samosa and pakora ($1.50 each). Digging into the eggplant and potato roti ($6.95 - pictured above), I had flashes of a similar culinary experience at Gandhi further east along Queen. And why shouldn't I? It just so happens that this unassuming spot in Parkdale is owned and operated by the same person - Avtar Singh. He opened Mother India as a hedge in case high rents eventually force him out of his bustling space near Bathurst. In the early days, Mother India didn't just borrow recipes from its more established sibling, but it also received daily shipments of Gandhi's famously fresh roti shells, once made exclusively on the premises at 554 Queen East. Luckily for Parkdale roti hounds times have changed. Mr. Singh has since sprung for a second roller, making it even more difficult to distinguish the creations coming out of the two kitchens. In fact, I would go as far as to say there are really only two differences between the roti experience at Gandhi and Mother India. The first is the atmosphere. Gandhi still packs 'em in and the hustle and bustle of jostling for your order and fighting for one of the twelve seats at Ghandi is all part of the experience that keeps me going back. The second is the spice. At Gandhi, medium is hot; and hot is fire. Mother India tones it down a bit. But for Gandhi Roti lovers who do make the journey west along Queen, the manager at Mother India assures me that they can up the heat a little. All you need to do is ask for your roti to be "Gandhi-spicy". On Thursday night I went to check out Mother India, a new restaurant that opened a couple week ago in Parkdale near Queen and Lansdowne. At 9pm the place was pretty quiet, save for a table of four and the kitchen staff; but given the newness and that they still haven't secured a liquor license, we didn't take this as a major warning sign. 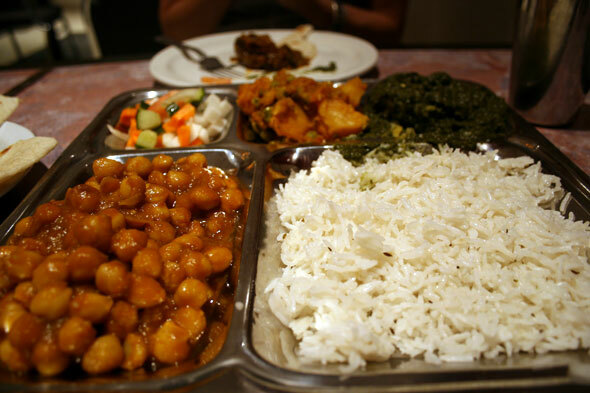 To accompany our waters, we opted for the vegetarian thali ($7.95), a selection of perfectly spiced dishes including aloo gobi , chana masala , saag aloo (spinach and potatoes) and basmati rice. The saag aloo was particularly outstanding - some of the best I've had in recent memory. We wiped our plates clean. 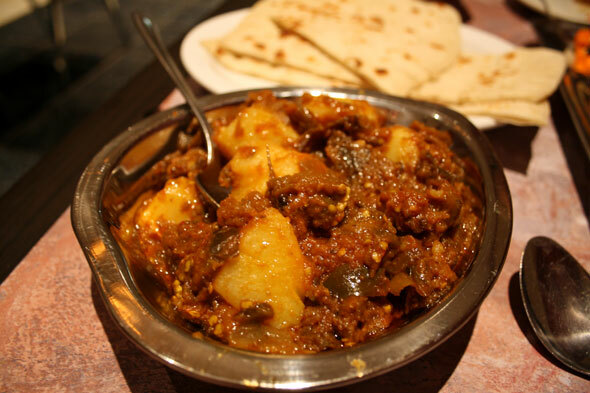 We also ordered some eggplant and potato ($7.95) which didn't disappoint, as well as a generous portion of naan . The service was pretty fast and friendly and by the looks of it they've already found some take-out customers in the neighbourhood. One note of caution. The ambience and decor at Mother India is pretty basic. While I applaud them for skipping the Indian restaurant tradition of white tablecloths, the tables and chairs are sort of 80's hospital cafeteria-esque and the lighting needs to be re-thought. But for perfectly executed indian food on a budget (and great thali) it's worth a visit.